ww2dbaseMark Wayne Clark was born in Madison Barracks, New York, United States and grew up in Illinois. He graduated from the United States Military Academy at West Point in 1917 and immediately served in WW1 in France with the US 11th Infantry at the rank of captain. During the inter-war years, he served as a deputy commander of the Civilian Conservation Corps district in Omaha, Nebraska. He attended the Command and General Staff School in 1935 and the Army War College in 1937.
ww2dbaseIn WW2, Clark was the Deputy Commander for Operation Torch, which was the Allied invasion of North Africa. Over the night of 21-22 Oct 1942, he covertly landed at Cherchell, Algeria to meet with Vichy French commander Charles Mast to secure cooperation. In 1943, he was promoted to the rank of lieutenant general, and was the younger officer to have done so. His close working relationship with George Marshall (who was a possible cousin of his) and Dwight Eisenhower allowed the superiors to discover his leadership talents readily, giving him a quick rise through the ranks. 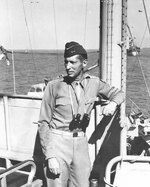 In Sep 1943, he led the US 5th Army during the Salerno landings in Italy. In Dec 1944, he was assigned overall command of the 15th Army Group, or in other words giving him operational control of the entire Allied operations in the Italian campaign. He became Commander of Allied Forces in Italy before the end of the war. ww2dbaseDuring the years following the European War, Clark was the US High Commissioner of Austria. ww2dbaseDuring the Korean War, Clark took over command of the United Nations forces on 12 May 1952. He signed the cease fire agreement with North Korea in the following year. ww2dbaseClark retired from the army following the Korean War and served as the president of the military college The Citadel in Charleston, South Carolina until 1966. Clark passed away in 1984 and now rests in peace at The Citadel. 1 May 1896 Mark Clark was born. 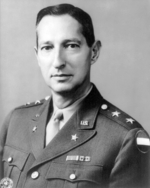 1 Jan 1944 General Mark Clark became the commander of US Fifth and Seventh Armies. 17 Apr 1984 Mark Clark passed away. Clark's US 5th Army would liberate Rome on the 4th June 1944. This has event has however, been the subject of much controversy as Clark took it upon himself to divert his army from cutting off the retreat of the beaten German 10th Army to take the glory of being the first Allied formation to enter the Holy City. According to General McGreery, Alexander was livid to hear of Clark's actions, but overall the liberation of Rome proved to be a boost to the morale of those troops awaiting to take part in the Normandy landings, as well as gaving encouragement to the many of the millions of people across Europe who were still living under German occupation. How can I find out if my father served under Clark?